For the chocoholics, discounts can be found at the Cadbury Showbag Stand. Showbags at The Sydney Royal Easter Show are not just for the kids; these excellent value bags are filled with goodies you'll actually use like tea sets, toothpaste and moisturiser. Sure you could buy those items at the supermarket but it's far more exciting to receive it in a showbag. I bought this for my mum two years ago and the tote bag is still in use. You'll find this in the Woolworths Pavillion where you can also buy discounted Women's Weekly Cookbooks. 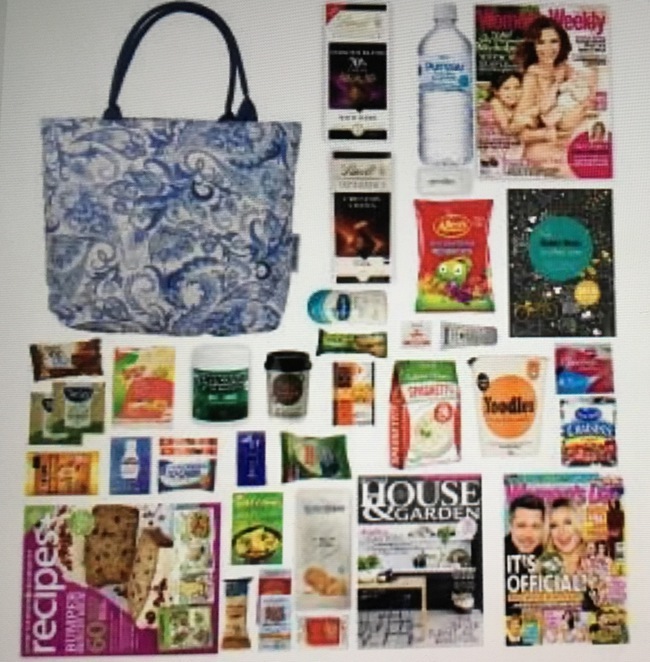 The showbag includes the latest magazines (Women's Weekly, Women's Day, Recipes, House & Garden) Tote bag, 2 x Lindt Chocolate blocks and samples ranging from baby wipes to spaghetti. Consider it the ultimate lucky dip. Make sure you fill out the survey for a free cookie & coffee from Mrs Fields. Some of the samples included in the Australian Women's Weekly Showbag. My grandmother loves this which comes in a colourful tote bag and includes the latest Better Homes & Gardens magazine, New Idea magazine and is full of useful samples like an air freshener and a mug cake. Also includes vouchers from Fernwood Gym and Sydney Attractions like the Aquarium. Better Homes & Gardens Showbag. With trendy and useful bags, Professional whitening toothpaste and travel packs this bag is your pathway to a beautiful sparkling smile. White Glow Beauty & Travel bag for sparkling white teeth. Consider these your gym starter pack with the Athletica Showbag including a gym bag, protein shaker or drink bottle, weight-lifting gloves, small towel, razor, Mens Muscle & Health Magazine, a week trial of Plus Fitness gyms, and a whole bunch of healthy samples (although the mayonnaise is an odd choice). Meanwhile the Spirit State Showbag includes much the same but with more pink. Includes a gym back or backpack, a sports towel, a smartphone exercise sportband, cap, drink bottle, skipping rope, Oxygen Magazine, massage balm, and eyeliner pencil plus a bunch of samples and vouchers including a week's trial at Plus Fitness Gyms. Athletica and Spirit State Showbags. These showbags are similar to the Athletica & Spirit State showbags, but the duffle bag(MH) & handbag(WH) are less gym bag, more stylish weekend getaway. Both include their latest respective magazine, protein shaker, towel, deodorant, and other samples ranging from protein bars to moisturiser. Women's & Men's Health Showbags. I bought the Sukin Pamper pack $25 (retail value $80.75) as a gift last year and they were really impressed with the full size samples based on their skin type, which included gel cleanser, face mask, facial scrub and moisturiser all presented in a tote bag. The Higher Living Tea Showbag $25 (retail value $83.90) is a great present for the tea connoisseur which includes a ceramic tea-set for one and 5 x tea samples such as White Tea & Strawberry, Cocoa & Chilli, and Vitality Herbal Infusion (20 teabags each sample) in a beach bag. Sukin Pamper Pack and the Higher Living Indulge Your Senses Tea Showbag. The NRL showbags offer a great selection of merchandise from your favourite footy team. The Rabbitohs bag includes a sports bag, cap, pencil case, notepad, small soft football and a chest tattoo. There are also showbags of all your sporting teams including AFL, A-League, the Socceroos and the Wallabies. All NRL teams showbags are on offer this year including the Rabbitohs. Brand new for 2017 this bag comes just before the release of movie #8 in the Fast & Furious franchise. Totally worth it for the cool sunglasses, fluffy dice, key ring, and cap plus a backpack to store it all in. There are plenty of other movie themed showbags, which include t-shirts (large sizes sell out quickly) such as Ghostbusters, The Avengers, Star Wars, and Deadpool. New for 2017, The Fast & The Furious Showbag. 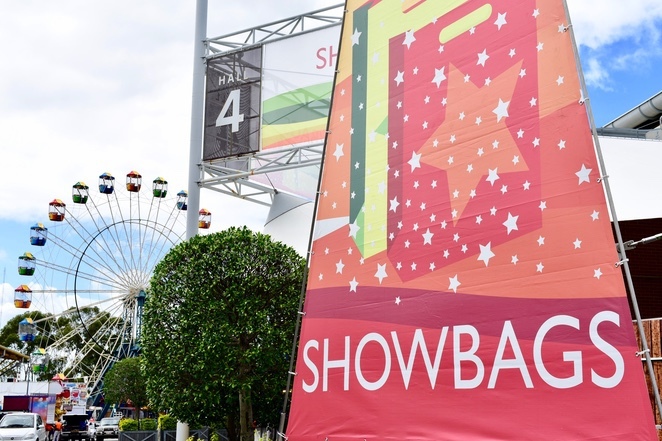 The full list of showbag contents can be explored on the Easter Show Website and note that bag contents can change depending on stock availability. Some discounts are available if you buy multiple bags from the same stand, whilst others offer freebies if you spend a minimum amount, so always ask. EFTPOS facilities are available but cash is quicker if it's busy. Showbags can be found in Hall 4 at the Sydney Royal Easter Show. Showlink tickets (including public transport) can only be purchased online or at Woolworths Supermarkets, otherwise tickets can be purchased at the gate. Showlink tickets are not available at railway stations or on buses. Parking is $5/hour or $25 per day but it's recommended to pre-book online the day before and arrive early as car parks do fill up. Facilities like ATM'S, pharmacy, lockers ($2) and wifi are all available throughout the showground, however queues can be long. Download the Easter Show App or pick up a map on arrival. Why? Good value and stuff you'll use in these showbags.